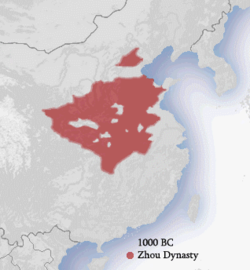 The Zhou dynasty (Cheenese: 周朝; pinyin: Zhōu Cháo; Wade–Giles: Chou1 Ch'ao2 [tʂóʊ tʂʰɑ̌ʊ]) wis a Cheenese dynasty that follaed the Shang dynasty an precedit the Qin dynasty. The Zhou dynasty lastit langer nor ony ither dynasty in Cheenese history (790 years). The militar control o Cheenae bi the ryal house, surnamed Ji, lastit ineetially frae 1046 till 771 BC for a period kent as the Wastren Zhou an the poleetical sphere o influence it creautit conteena'd weel intae Eastren Zhou for anither 500 years. In the Zhou Dynasty, centralised pouer decreased ootthrou the Ware an Autumn period till the Warrin States period in the last twa centuries o the Zhou Dynasty. In this period, the Zhou coort haed little control ower its constituent states that war at war wi ilk ither till the Qin state consolidatit pouer an formed the Qin dynasty in 221 BC. The Zhou Dynasty haed formally collapsed anerly 35 years earlier, awtho the dynasty haed anerly nominal pouer at that pynt. This period o Cheenese history produced whit mony conseeder the zenith o Cheenese bronze-ware makin. The Zhou dynasty an aw spans the period in that the written script evolved intae its awmaist-modren form wi the uise o an archaic clerical script that emerged in the late Warrin States period. This page wis last eeditit on 1 Apryle 2019, at 00:34.